Professional soldiers need a professional knife and that is why Smith & Wesson has created the Special Ops Combat Notched Spine Knife. Engineered for combat application, the knife includes an ultra-durable construction, an ergonomic design and is loaded with an array of practical features. The stainless steel blade employs a notched spine, giving it extra tearing power when performing deep punctures. 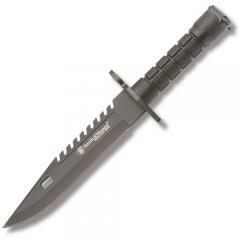 The handle features a cast metal guard to protect fingers and hands in close quarters battle (CQB) situations. Its spring clip pommel even allows for attachment to bayonets. Smith & Wesson includes a nylon sheath with a front pocket containing a sharpening stone, ensuring the Combat Knife is always in peak condition, ready for action.